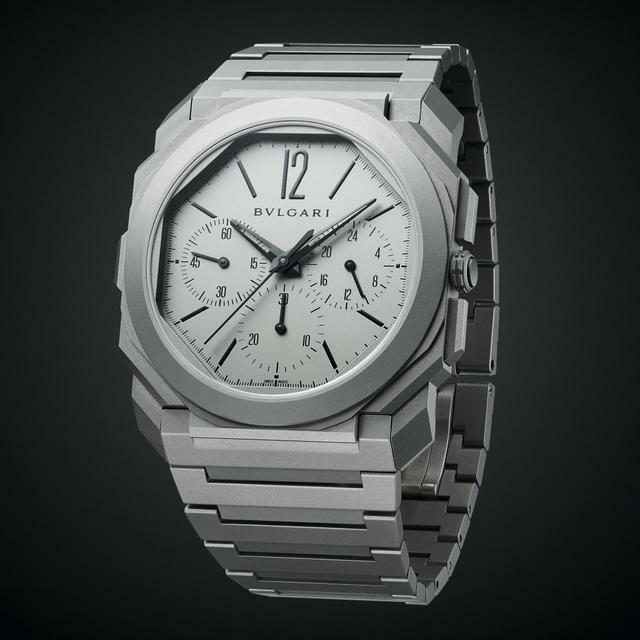 Bulgari’s four-year streak of ultra-thin watches, all record-breakers, has been extended to a fifth year at Baselworld 2019 with the launch of the Bulgari Octo Finissimo Chronograph GMT Automatic watch. Billed as the thinnest mechanical chronograph, with its 3.30mm thick mechanical manufacture GMT chronograph movement (Caliber BVL 318), the watch measures 6.90mm thick, with a 42mm diameter titanium case and sandblasted titanium dial. The new Octo Finissimo Chronograph GMT Automatic retains the peripheral winding rotor seen in last year’s record-breaking Octo Finissimo Tourbillon Automatic and adds a GMT function (local time is set by the pusher at 9 o’clock). 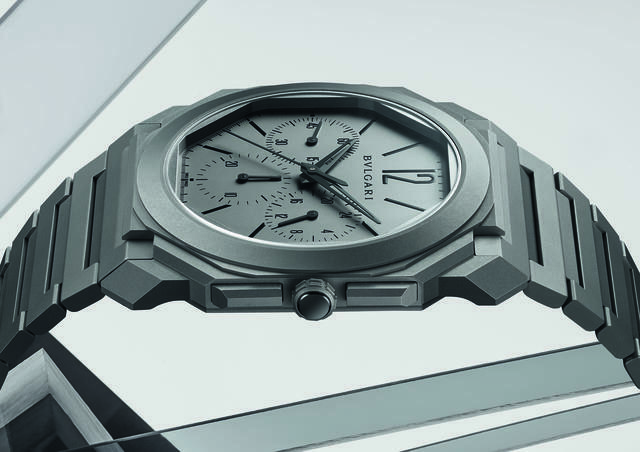 Bulgari’s new ultra-thin movement is fully integrated and displays classic chronograph functions. It indicates home time on the subdial at 3 o’clock and indicates day or night. The watch’s chronograph minutes counter is positioned at 6 o’clock while the small seconds counter is at 9 o’clock. Even with its super-thin profile, the BVL 318 caliber, visible through the clear sapphire caseback, offers a healthy fifty-five-hour power reserve. 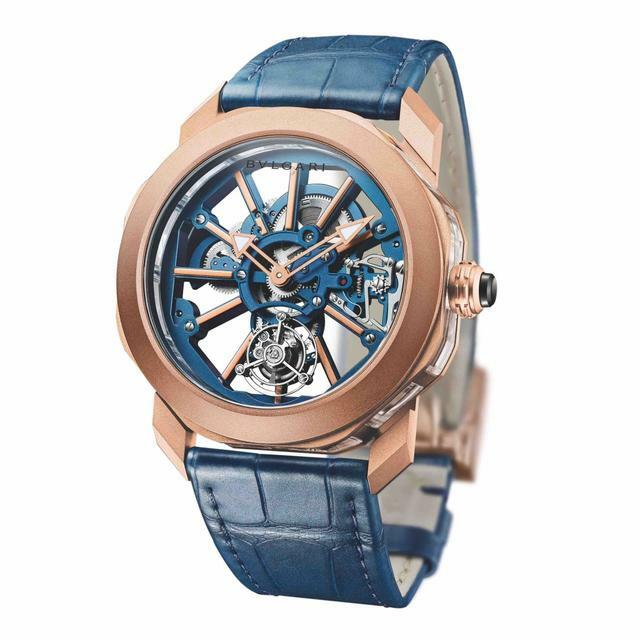 We’ll have additional details on this latest Bulgari record-breaker, and all the Bulgari 2019 debuts (including a beautiful Octo Roma Tourbillon Sapphire, pictured below) in upcoming posts. 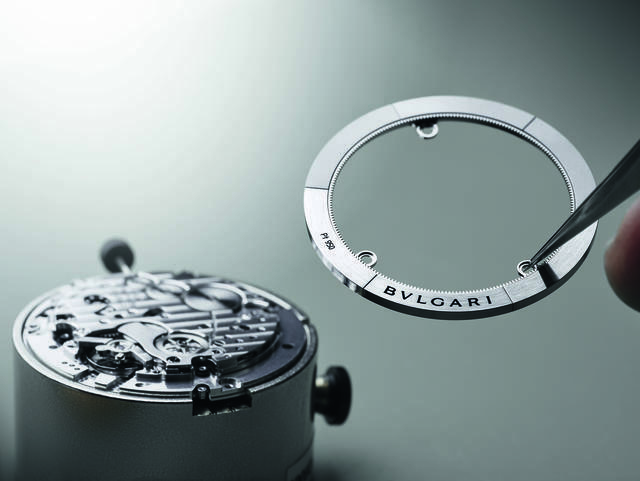 Movement: Mechanical manufacture chronograph and GMT movement with automatic winding (peripheral mass) and small seconds - BVL 318 caliber (3.30mm thick). 55 hours power reserve; local timezone adjusted through the push button at 9h. Case and dial: 42 mm extra-thin titanium case (6.90 mm thick) with transparent case back; titanium crown set with ceramic; sandblasted titanium dial; water-resistant up to 30 meters. Bracelet: Sandblasted titanium bracelet with folding clasp.